I’ve had a difficult time this year drying my flax. I got the first batch dried, rippled and retted. Then the rains started coming, so the next drying stage was delayed. Meanwhile, the rains caused the other flax beds to fall over so one of them was quickly harvested. That flax was put up against the fence in the hope that it would eventually dry and I could ripple it. The rains kept coming and coming. Nothing was drying. So I decided to use the rains to my advantage and instead of leaning them up against the split rail fence, I put them on the grass. At least the downpours could continue to rinse the smelly swamp water from the first flax. And the hope was that the steady stream of water could start to dew rett the other flax, despite the fact it hadn’t been rippled and was still full of leaves and seed pods. The sun finally came out yesterday and it’s still here today. So I decided to take advantage of the sun and heat and do some active things to encourage drying. I got the drying rack and stacked the retted flax onto it. Then I had a look at the non-rippled flax that I threw on the ground. I flipped it to get the really wet side in the sun. Lo and behold! It’s starting to rett. You can see the fine wisps of linen fibres on the edges. It doesn’t go all the way up the stem, it’s mostly happening down near the root end, where there are no leaves. About an hour later, encouraged by the heat and sunshine, I moved the drying rack over to the driveway. The gravel in the driveway heats up and we can really push this drying number today. I took the flax from the shade of the second and third level of the rack and put it on the ground. Inspired by the retting results of the non-rippled flax, I moved it from the lawn over the driveway next to the retted flax. Using the jet stream on the hose, I power-washed as much of the rotten leaves from it as I could manage. And now the whole lot is drying. I’ll flip it every hour or so, until the sun comes down. And then everything is going under cover. Enough of this. And last but not least is the harvest of the final bed. I have this off the ground, all stacked up on the garden bench. It can’t stay there. I have to fashion something that will help it dry – but we have some more rain coming in this week. I need an Indian Summer to get this stuff finished off. Time to head back out and flip the flax. This entry was posted in flax, growing flax, harvesting flax, linen on October 6, 2013 by DianaTwiss. On Thursday this week, in the late afternoon, I harvested the first field of flax. It’s growing in our south garden. It was the first plot planted this season and I expected it to be ready first. But this garden gets quite a bit of shade throughout the day, so it slowed things down a bit. Here it is in tidy bundles (something I didn’t do on the first harvest) leaning against the fence. And here’s what’s left growing. It was planted much later than the other two beds. And it was only really planted to hold the spots and keep the weeds at bay. I never imagined it would grow this quickly. I am sure it will bloom in the next week or so, and then I’ll have even more to manage. Now that’s a problem I don’t mind having. This entry was posted in flax, growing flax, harvesting flax on August 3, 2013 by DianaTwiss. I currently have four wee plots (I call them fields) of flax growing. They were not all planted at the same time. Field one (south garden) was planted in the second week of May. Field two (north west garden) planted three weeks later. And fields three and four (north east garden) were planted four weeks after that. 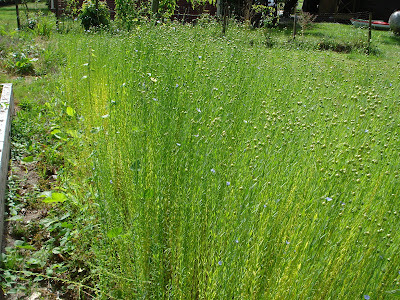 After about seven weeks of growing, flax starts to bloom. Flax blooms in the morning and it’s a lovely sight. The flowers are tiny, plentiful, and a beautiful periwinkle blue. I have enjoyed watching the first two fields bloom. So little effort on my part, and so much beauty. Last weekend I looked out of my studio window and noticed that the flax field in the north west garden had stopped blooming.The flax in the south garden was planted a full three weeks earlier and I was fully expecting it to be ready before the flax in this, the north garden. But that’s the power of sunshine for you. Ever since the oak tree came down, the north west and east gardens get sunshine from sunrise until sunset. The south garden, bordered by a large cotton-wood tree, sits in full shade from 2 – 6pm every day. So this field was ready for harvest while the south garden, planted a full three weeks earlier was still blooming. 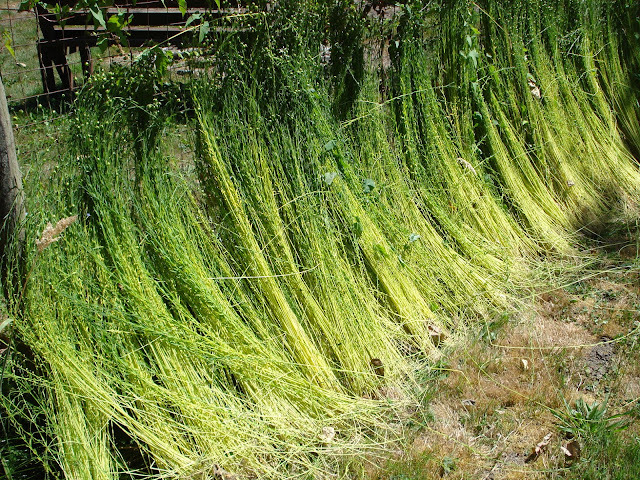 And so, on a hot, sunny Saturday afternoon, I decided to harvest the flax. Harvesting flax is quite straightforward. 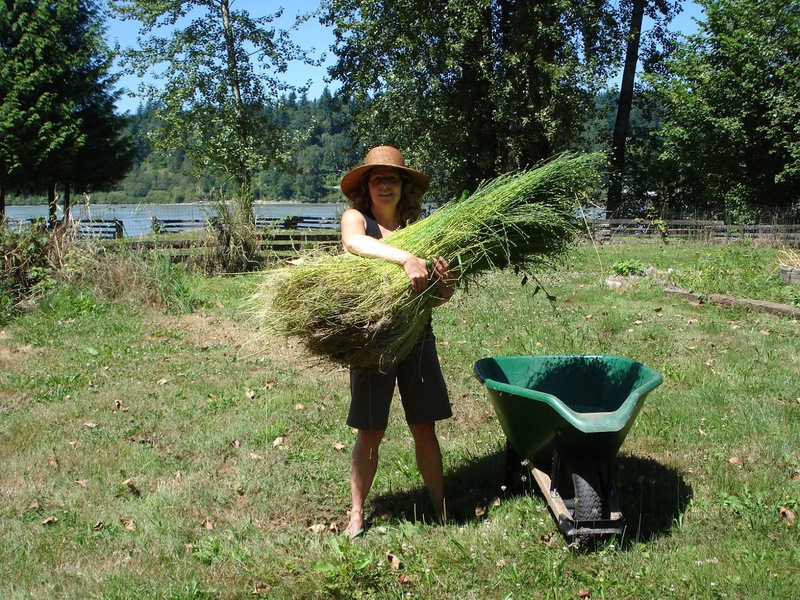 Grab a large handful of flax and pull, roots and all. Like below. Knock dirt off roots, place in wheelbarrow. Repeat and repeat and repeat. Here’s the full harvest from flax field #2. This “Evelin” variety of flax is a true linen variety. 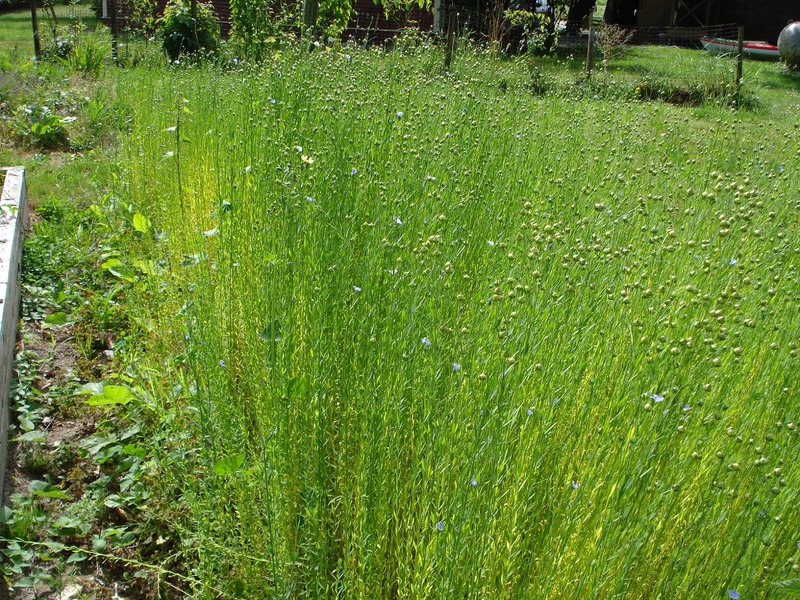 Compared to the flax I grew last year, which was more of a flax seed variety, this one is much longer, easily twice the height, and the stalks are much more substantial. And here it is, leaned up against the fence for drying. 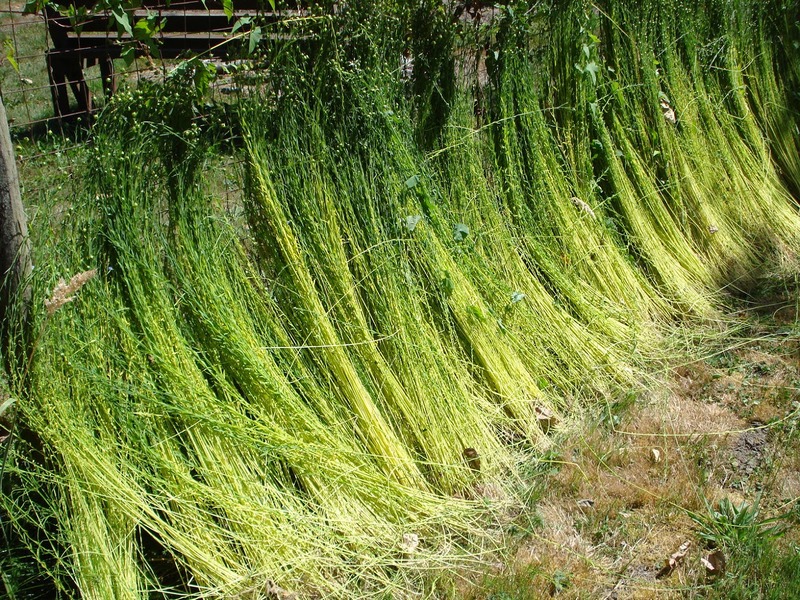 Because I kind of know what I’m doing this year, and have better equipment (I’m on the lookout for a kiddie pool for the retting stage), I am really excited about the flax this year. This past year I even learned how to dress a distaff and spin flax, so there may actually be more yarn produced this year than last year. But I won’t get ahead of myself. There are many stages to go through before this stuff is ready for weaving. I’ll keep you posted. 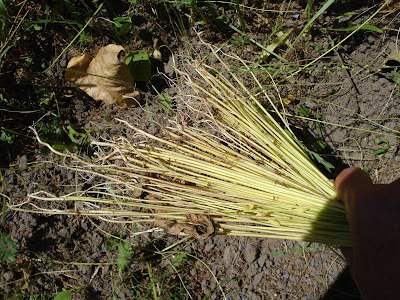 This entry was posted in flax, growing flax, harvesting flax, linen on August 1, 2013 by DianaTwiss.